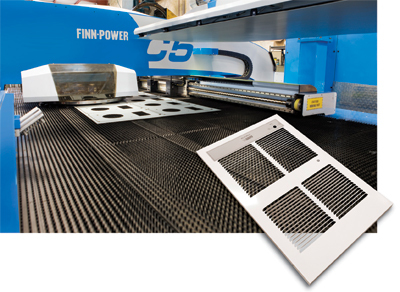 A major feature of this new turret punch press allows King Electric to upform louvers in heater grilles. That and other machine features enable the company to reduce material usage and secondary operations while improving productivity. When Bob Wilson founded King Electric Mfg. Co., Seattle, WA, in 1958 in a 9500- sq.-ft. facility with three employees, he outsourced all sheetmetal fabrication and concentrated on assembly and sales of a single product line—baseboard heating units. Through the years, the company thrived and evolved into a full-line heater manufacturer with such product lines as residential and architectural-grade fan heaters, electrical furnaces, radiant convection heaters and commercial-unit heaters. Along with the product-line expansion, King Electric’s market area has expanded throughout the United States, Canada and South America, selling through electrical distributors such as Graybar and retailers such as Lowe’s. Today, King Electric operates out of a 100,000-sq.-ft. facility with 110 employees, now fabricating sheetmetal parts inhouse. By 2006, the company arrived at a crossroads, threatened by low-cost competition from China and an emerging customer-service backlog created by aging fabricating equipment and outdated manufacturing strategies and techniques. “Many of our competitors were starting to import their products from China,” explains Dean Wilson, King Electric’s executive vice president of manufacturing, who rejoined his father’s company in the midst of these pressures. “We had to find a solution in order to compete.” Wilson took a two-week industry tour of China and spoke to many Chinese manufacturers, trying to determine any benefits from giving up his company’s manufacturing operations and instead importing its products from China. He also began evaluating an alternate strategy for modernizing and automating the existing facility. At the time, King Electric’s metalworking equipment consisted of hard-tooled punch presses, press brakes and old mechanical turret-punch presses. “We were a batch-run-oriented shop,” says Wilson, pointing out one of the company’s manufacturing problems at the time. For example, producing 500 heaters meant several different batch operations in progress to complete the job. The process lacked coordination in each batch operation, with some operations producing 500 parts and others as many as 5000. Older equipment not able to take advantage of newer shop-floor technology compounded problems. An old mechanical turret punch press could not utilize the latest nesting software or advanced tooling, resulting in wasted production steps. Sheet had to be blanked to size on a shear, moved to the turret press for fabrication, then moved back to the shear to cut out the part. To address these issues, in 2007 the company purchased a C5 Compact Express automated turret press from Finn-Power International, Arlington Heights, IL, drawn by its high level of technology, according to Wilson. The 20-station, 33-ton hydraulic turret punch press has a maximum sheet capacity of 50 by 100 in. Its compact load/unload automation allows unattended production utilizing space above and below the machine for sheet storage, and features simultaneous loading and unloading during processing. Tooling flexibility is important to King Electric—the company has five auto-index, three upforming and three Multi-Tool stations in the C5. Unique to this turret punch press, full-tonnage indexable upforming allows complex forming operations to be made quickly using a single forming tool, according to Finn-Power officials. Upforming capability comes in handy as key to King Electric’s manufacturing operation is its ability to make louvers. The upforming feature on the C5 allows forming heights to 0.62 in., with the die moving upward then retracting, allowing free sheet movement and eliminating scratched or jammed sheets. The C5 Compact Express automated turret press operating at King Electric offers rapid hydraulic punching with nibbling speeds to 1100 hits/min., and the servo-controlled ram, stroke speed and position are fully and individually adjustable in both directions. Another benefit: the different punching modes—punch, Quiet Punch, downforming and marking. Four optimally positioned gauge pins allow simple loading of blanks or full-sized sheets with sheet loading performed with a slight push, and sheet supports rise from the table to allow simple positioning of heavy material. 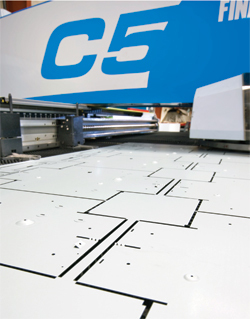 To increase operator efficiency, the C5 delivers parts to a freely programmable position on the table and material flow for the entire process can be conducted from just one side. This allows for simple and efficient logistics and enables the machine to be positioned anywhere on the shop floor, even in a corner. Finn-Power’s patented automatic clamp setting, a standard C5 feature, positions sheet clamps according to the numerical program, virtually eliminating dead zones, according to Finn-Power officials. Its work-chute design allows the reception of several parts in sizes to 19.7 by 19.7 in. onto a level from which they subsequently exit from the machine as a stack. Another challenging part, a grille with a louver at 54 deg. for intake air and another at 90 deg. for discharge air, benefitted from the new turret press as the punch height of the tool on the old mechanical turret press could not be changed, making this a two-step operation. On the new C5, King Electric makes these louvers in a single operation on a nested 4 by 8-ft. sheet that yields 24 parts. Before, these parts were produced one at a time. Now, using the machine’s automatic loader/unloader, the company produces these parts without operator labor and load/unload labor, to the tune of 60,000 parts annually. According to Wilson, the new turret punch press has made the whole shop more productive. The C5 Compact Express at King Electric runs 40 hr./week and often performs lights-out production for jobs running as long as 20 hr. Wilson has the turret press hooked up with a web cam to monitor the machine remotely. “The C5 allows us to maintain control over our factory operations,” says Wilson. “Now when we quote a lead time to a customer, we meet it. Lead times that were 10 to 12 weeks now are 2 to 3 weeks. Today, we are almost building to order. We now have a lot of predictability that takes out a lot of stress for our managers. • Raw material usage reduced by 30 percent due to elimination of pre-sheared blanks and creation of less scrap and bad parts. Information for this article provided by Finn-Power International, Inc., Arlington Heights, IL; tel. 847/952-6500, www.finn-power.com.